Entering the night without disturbing its natural order has always been a challenge. Flashlights scare away the animals. Daylight optics and our own eyes are just not designed to see in low light conditions. Night vision monoculars of the Patrol series help you meet this challenge adequately and feel at home even in the darkest conditions. The new Patrol line represents wide range of optical characteristics. Compact and handy Patrol 2x24, Patrol-D 3x42 and Patrol 4x50 each designed to fulfill requirements of multiple applications. New electronics designed for reliable and prolonged operation allow for up to 72 hours of continuous work without replacing its two AAA batteries. Range features a wide field of view Patrol 2x24 which makes it perfect for observation of dynamic objects. The Patrol-D 3x42 is a set consisting of the Patrol 2x24 and a 42mm booster lens that increases magnification up to three times. The Patrol 4x50, featuring high light gathering capacity and even more impressive magnification is a sure choice for longer distance steady observation. Do not point the unit towards any light source greater than 1 lux (such as car headlights) for an extended period of time. Exposure to bright lights can damage the unit. Any such damage may void your warranty. Your Patrol was designed to be self-contained. Do not open the body of the scope or otherwise attempt to service this device. Always store the Patrol in a dry, well-ventilated room. Keep the Patrol away from any heating and air conditioning vents or other heating devices, direct sunlight. Avoid dropping or otherwise shocking the unit. Although designed for rugged outdoor use, the Patrol incorporates a sophisticated optical system which could be damaged in extreme cases of misuse. Clean optical parts (lenses) with professional lens cleaning supplies designed for use with multicoated optics. Damage to this device from failure to observe these warnings may void the Patrol’s warranty! Your Patrol runs on two AAA batteries. To install, unscrew the battery compartment cover, insert the batteries into the battery compartment so that the positive (+) and negative (-) terminals of the batteries match the markings inside the compartment, replace the battery cover carefully. Do not overtighten. Make sure that the two AAA batteries have been installed according to instructions found in the battery installation section of this manual. Move into a dark area before activating the Patrol unit. Remove the lens cap (1). Slide it on the housing of the device (if you own a Patrol 2x24 or Patrol-D 3x42). Hints how to set up a Patrol-D 3x42 unit: Remove the protective cap from the booster lens. Insert the booster lens into the objective lens of the device up to the stop and, preventing the objective lens from overtwist, rotate it clockwise so that the three protuberances at the bottom of the booster lens engage the grooves inside the objective lens. Activate the device by pushing the "ON" button (3). If you wish to test your night vision device in a lighted area, be sure the protective cap of the booster lens is in place prior to pressing the “ON” button. The lens cap has a pinhole opening to admit a small amount of light for testing purposes. If the subject to be viewed is in a completely dark area, including lowlight shadow areas, activate the infrared illuminator by pressing the “IR” Button (2) located next to "ON" button. Direct your device at an object at a distance of 10-100 m. (32 - 110 yds). Focus on the rough surface of the tube's screen by moving the lever of the eyepiece (4), then achieve the best quality of the object you are viewing by rotating the objective lens (5). If necessary, re-focus the eyepiece. After this adjustment, do not rotate the lever of the eyepiece irrespective of the distance and other conditions. Direct your Patrol device at the subject to be viewed and adjust the final focus by rotating the objective lens (5) focusing ring until the image quality is optimal. The unit has a LED indicator performing two functions. The green light indicates that the unit is on. When you turn on the IR illuminator, the LED indicator changes its color from green to red. To turn off the device and the IR, push the “ON” button – the LED indicator will go out. Affix the lens cap back to the unit and the booster lens of the Patrol-D 3x42. To remove the booster lens, turn it counterclockwise and pull. Caution! Do not enter the lighted area with the protective lens removed. After the Patrol unit is off, wait at least 10 minutes before removing the booster lens (for Patrol-D 3x42). Note: You can use the Patrol-D 3x42 unit without the booster lens. In this case you are using the Patrol 2x24. Your Patrol can be used in extreme cold. However, when the unit is brought back into a warm environment, you must wait approximately 2-3 hours before using the unit again. Failure to do so may result in damage as a result of condensation accumulating on the internal circuitry of the unit. Clean the lens with professional lens cleaning supplies intended for use with multicoated optics. Blow any dust or dirt off the lenses using dry, compressed air. Clean the Patrol housing with a soft, clean cloth coated in petroleum jelly or similar synthetic material. Always store the Patrol (in its case) in a dry, well-ventilated area away from heating/air conditioning vents (or other heating devices). Remove the battery if the device is to be stored for longer than 2 months. Check that the batteries are installed properly. Install the batteries according to the (+) and (-) polarity, ensuring that the markings on the battery and battery compartment correspond with one another. Check the battery contacts to ensure they are clean and free of corrosion; if necessary, clean the contacts. If necessary, replace the batteries as they may be depleted. Also, be sure that the power is in the “ON” position when trying to turn on the scope. These dots are minor cosmetic blemishes resulting from tube production processes and do not interfere with the reliability or performance of the scope. The scope may flicker or flash when used in a bright environment; to correct this, place the cap over the objective lens and enter a dark environment. The scope will restore itself to a natural functioning state in several minutes or hours, depending on how long the scope had been exposed to the light. 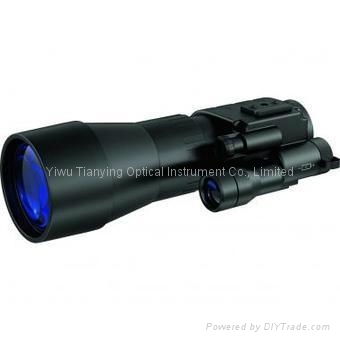 The scope may flicker for the first several seconds of use, even when in a dark environment, before the scope corrects itself and functions properly. The scope may “snow” for several minutes after being exposed to a bright light source (daylight, a car's headlights, fire, etc.) even if being operated in complete darkness (in this case you should turn the IR illuminator on). Adjust the focus of the eyepiece and the objective (see Use and Testing). Check that the lenses are not foggy or dusty; if they are, carefully clean the external surfaces of lenses with a soft cotton fabric. Replace the batteries if the total battery charge is less than 2.2 V. When the unit is brought into a warm environment from a cold one, condensation may appear on the internal lenses; you must wait two hours before using the unit. Bright light sources, such as headlights, may cause visibility to decrease or disappear and the image to flicker. Turn the power off and turn the scope away from the light source; visibility will restore itself in several minutes.